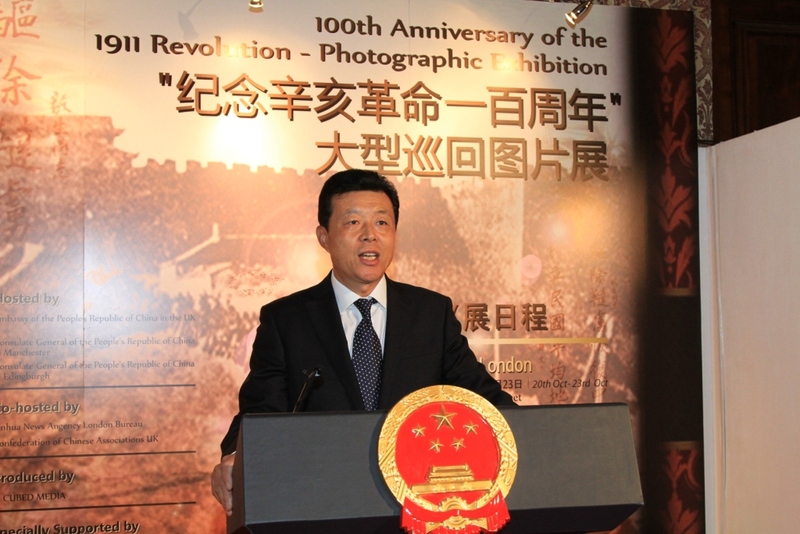 I very much welcome you to this photographic exhibition marking the 100th anniversary of the 1911 Revolution. 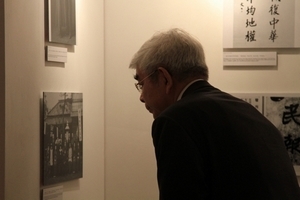 This exhibition is part of a collection of events hosted by the Chinese Embassy to remember the 1911 Revolution. These photos provide vivid records of how this history-making revolution came about in China one century ago. The images can help us grasp what the 1911 Revolution meant to the Chinese people and how it left a lasting mark on China. Following its first leg in London, the exhibition will go on a UK tour. It will be in Liverpool later this month and Edinburgh in early November, with assistance from the Chinese Consulates in Manchester and Edinburgh. 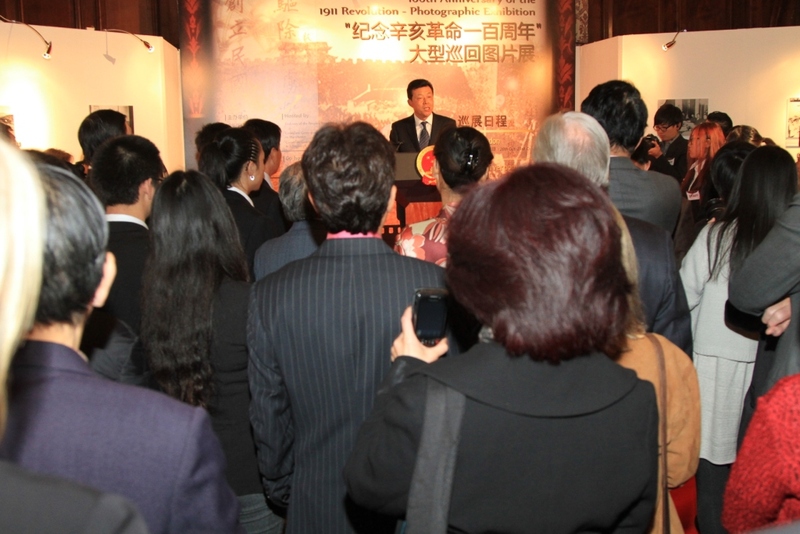 I must thank the Xinhua News Agency London Bureau and the Confederation of Chinese Associations UK for your contribution to the exhibition. And my thanks also go to China Ocean Shipping Company UK for your kind support. This year is the centenary of the 1911 Revolution in China. The Chinese people at home and in many parts of the world are commemorating this epoch-making event. People may ask: what does this revolution mean to China? "The revolution of 1911 greatly freed the minds of the Chinese people, opened the flood gates for progress in China and explored a path for the development and progress of the Chinese nation." Some compare history to a great river, flowing day and night unceasingly. Some say the progress of history is like mountaineering. To climb higher and reach the summit, you must go step by step. The 1911 Revolution is important in the sense that it represents an irresistible current and a significant step in the course of the Chinese history. It's remembered as a seminal event that carried the Chinese revolution into a new stage. To be specific, the 1911 Revolution's importance is three-fold. First, the revolution overthrew the corrupt Qing Dynasty. · It put an end to more than 2000 years of autocratic monarchy in China. · It set the Chinese people on a course to build a republic. · All these were great achievements that in hindsight have utterly transformed China during the past one hundred years. · and putting people first. These ideas awoke the Chinese people to the path forward. This force of new thinking guided the movement and pushed forward sweeping changes. This swept away the outdated way of life and added momentum to great social transformation. Men in China happily shaved off their pigtails, which were imposed by the Qing rulers. Women threw away the cloth that bound their feet. The Chinese society took on a new and modern look. A new chapter was thus written in China's history. Third, the revolution ushered in the era of a new democratic revolution in China. However, for all its achievements, the 1911 revolution failed to bring fundamental changes to China. China remained a weak, poor country divided by warlords and ravaged by internal conflicts. China continued to be exploited and suppressed by imperial powers, and the Chinese people still lived in great misery and desperation. It's in this context that the Communist Party of China moved to the front stage of the modern development of the Chinese people. It was the Communist Party of China that led China toward real change. It has been this leadership that has revolutionised the lives of all in China. The 1911 Revolution was the first tipping-point on China's path toward revolution and rebirth. In the following decades, the Communist Party of China steered the nation through another two great transformations. The first huge change was the founding of the People's Republic of China. This established the socialist system, and achieved national independence and people's liberation. And the second great transformation was the reform and opening-up in late 1970s, which brought China and its people closer than ever to the goal of prosperity. Only with such a journey of exploration, could China become what it is today. And the Chinese people have every reason to be proud of how far their country has come. Today, China is the world's number two economy and a prosperous and stable country. Its success story has caught the eye of the world. Looking forward, the Chinese people are devoting their best efforts to continue this national development and rejuvenation. I believe that history will record two broad themes arising out of the 1911 Revolution. Firstly, the Communist Party of China inherited the ideals and vision of Dr. Sun Yat-sen and the 1911 revolutionaries. Then secondly, the Communist Party has also taken their revolutionary cause forward in a way that is unprecedented. Today's exhibition shows photos that capture many facets of the 1911 Revolution. The pictures offer a unique window into understanding China's progress over the past century. The images offer the best example of the patriotism of the overseas Chinese in that period one hundred years ago. The photos symbolise the shared aspiration of the people across the Taiwan Straits for the great rejuvenation of the Chinese nation. Just under a hundred years ago a British journalist wrote a book called China's Revolution: 1911-1912. His name was Edwin Dingle. His book was based on his first-hand observation of the 1911 revolution. 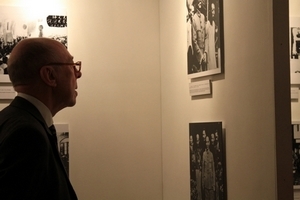 Dingle outlined the potential deep implications of the revolution for Chinese society and international relationships. "No one will doubt that, with such excellent qualities of common sense and eminent industry as the Chinese possess, we shall see a nation move that may move the world with it. The day will assuredly come, perhaps it is not so very far distant, when the Occidental observer will look around to see the globe girdled with an indissoluble bond of Chinese peoples, no longer too weak for aggression, but independent in all department of national life." Clearly Edwin Dingle had remarkable foresight. What he wrote of China has become reality today. In closing, I hope you will draw inspiration from this exhibition. It is a fine way to learn about the 1911 revolution and its far-reaching significance.